The new Windows 8.1 OS update comes with two free apps for users to edit or record videos easily and without any fees. Introducing the new Windows Movie Moments and Movie Maker apps. Before the arrival of the latest operating system update from Microsoft, downloading of all sorts of software tools is a requisite to complete certain daily tasks with their devices. One example is the Premiere Elements software that is used for video editing. Aside from the fact that these of tools are costly, majority if not all of them are not user-friendly. Good thing the latest Windows 8.1 update is finally here to resolve the underlying issues. The new Windows 8 OS update offers users not only one but two options to edit videos for free on their Windows devices. And this made possible through utilizing free video editing software for Windows devices, namely: a) Movie Moments, and b) Movie Maker. 1. Go to the Start Screen of your Windows 8.1 device by pushing the Windows key. HINT: The Windows key is located below your display. You can also press the Windows key on your keyboard. 2. Look for the arrow at the bottom left corner of the Start Screen and click on it to display a list of installed applications on your device. Another way to show all installed apps is by placing your finger on your device's touchscreen, and then swiping it up. 3. Look for the app labeled Movie Moments. You will then be prompted with the Movie Moment's screen. 4. Click or tap on Take a Video, for you to begin record and edit video. 5. Click or tap on Pick a Video to select a video to edit. NOTE: Windows 8 will then take you to your webcam depending on the type of device you are on and after you've allowed it to do so. Typically, Windows devices with rear and front facing cameras have a button installed at the bottom right. If you are using one of these devices, use that button to switch between cameras. 6. When editing a video with Movie Moments app, simply adjust the two rounded dots representing the beginning and end of a video you are working on. If you want to add some music to your video, simply tap the music button. Novice users of devices running on Windows 8 platform may now easily record or edit videos without a need to purchase any extra software. This is made possible with a new app called Movie Maker. To begin with, download Windows Essentials -- a suite that comprised of desktop versions of SkyDrive, Mail, Photo Gallery and Writer for free. 1. Wait until the download is finished and open the file. 2. Click or tap on Install Windows Essentials, to begin installation of the full suite of apps. 3. To separately install the Movie Maker and its associated desktop app Photo Gallery, click or tap on Choose the programs you want to install. 4. Once the installation is completed or done, click or tap on Close. 5. Go back to the Start Screen by pressing the Start button on your device or device's keyboard. 6. Click on the arrow at the bottom left corner of your screen. A list of installed apps will then show up. NOTE: Touchscreen device users would need to place their finger at the bottom of their display, and then swipe it upwards to show the same apps list. 7. Look for the Movie Maker and tap/click on it. 8. Click or tap on Accept. 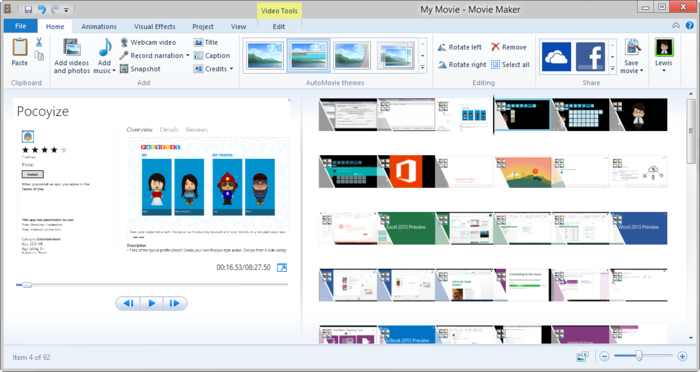 You should now have the Movie Makers installed on your Windows 8 desktop. To open recorded videos, simply click on the File button or click on the Webcam video button to record a new video through webcam. CONCLUDING NOTE: Movie Maker has more features than Movie Moments however, it may still lack the advanced options like those comprised in the Premier Elements.